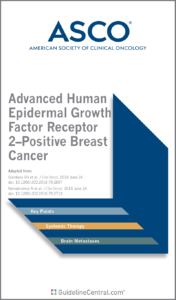 Advanced Human Epidermal Growth Factor Receptor 2–Positive Breast Cancer® Pocket Guide was developed in collaboration with the American Thoracic Society and is based on their latest Clinical Practice Guideline. This practical quick-reference tool contains graded recommendations for the use of mechanical ventilation, high-frequency oscillatory ventilation, positive end-expiratory pressure and recruitment maneuvers for patients with acute respiratory distress syndrome. 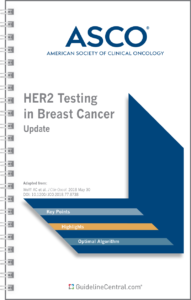 HER2-targeted therapy is recommended for patients with HER2-positive advanced breast cancer, except for those with clinical congestive heart failure or significantly compromised left ventricular ejection fraction, who should be evaluated on a case-by-case basis. 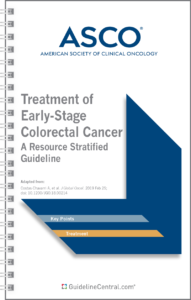 Patients with brain metastases should receive appropriate local therapy and systemic therapy, if indicated. Local therapies include surgery, whole-brain radiotherapy, and stereotactic radiosurgery.